Matty Taylor, who spent two years with Burnley from 2014 to 2016, has today announced he will be hanging up his boots at the end of the season after more than twenty years in the game. 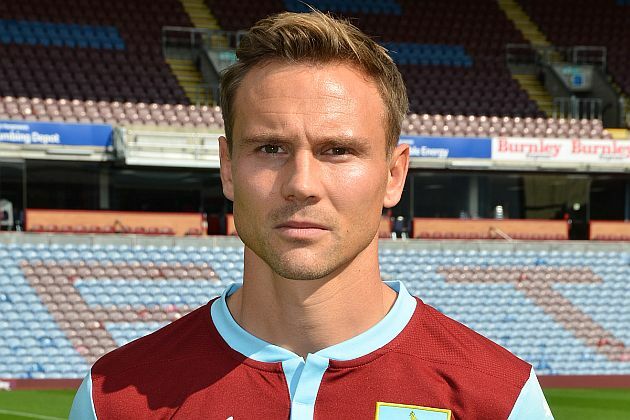 He was a long way from playing for Burnley when he made his league debut at the start of the 1999/2000 season on the day we opened our season with a 1-1 draw at Wycombe. Taylor was in the Luton side that day which drew 0-0 at Notts County. He played against us that season in our 2-1 defeat at Kenilworth Road. Taylor moved on to Portsmouth, Bolton and West Ham, playing for all three in the Premier League and becoming a very popular player with the supporters of all three clubs. His move to Burnley from West Ham in the summer 2014 looked a good one for us but he had a first season seriously interrupted by an achilles injury. He’d started the season in the team and went straight back in as soon as he was fit although he will probably best be remembered for failing to score from the penalty spot in a crucial game against Leicester. But it wasn’t the case in 2015/16 back in the Championship. He made 27 league appearances that season but all but one of them was a substitute. His only start was at Nottingham Forest where he scored our stoppage time equaliser. There were other major contributions from the bench, none more so than when we came from behind to draw at Brighton and at home against Middlesbrough. He left us after two years and spent a year at Northampton, a move Sean Dyche helped set up for him, and he’s since enjoyed two seasons at Swindon during which he’s started 62 league games. But at 37, and having already played 655 league games, he’s made the decision to retire from playing at the end of the season. It’s not clear whether he will remain at Swindon where is currently player/coach but he now has his UEFA Pro Licence and is almost certain to remain in the game. Smile? I was thinking about the corners that led to the Michael Keane goals against Brighton and Middlesbrough. They made me, and countless other Burnley fans, go crazy, let alone smile.